According to Reuters, the BlackBerry maker announced the plans while touting "massive" corporate interest in the device. "In large companies, they're talking deployment in the tens of thousands, right off the bat," said Jeff McDowell, RIM's senior vice president of enterprise and platform marketing. According to McDowell, corporations are seeing the PlayBook as an essential tool to employees, just like a phone or a PC. RIM apparently decided to use Sprint because it has the most "ubiquitous 4G network at this point." Sprint is currently the third largest wireless network in the U.S., with only Verizon and AT&T having more subscribers. Wireless carriers in the U.S. are currently in a 4G 'arms race,' vying for the titles of "fastest" and "largest" 4G network. AT&T on Wednesday outlined accelerated plans to deploy 4G LTE technology. Meanwhile, Verizon has begun rolling out its own 4G LTE network. The PlayBook tablet was available for hands-on demonstrations for the first time Wednesday at the Consumer Electronics Show. The device "performed smoothly as it went through its paces," according to the report. RIM has yet to set a price for the PlayBook, though the company has said it will sell the device for "under $500." A Wi-Fi only version of the device is expected to launch in the first quarter of this year. The report also noted that, according to McDowell, the PlayBook's battery life "will last as long or longer than other 7-inch tablets." 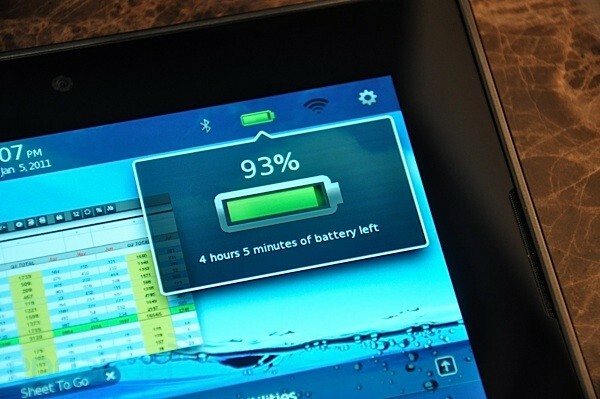 Samsung's 7-inch Galaxy Tab gets approximately 6 hours of battery life. By comparison, Apple's iPad gets 10 hours of battery life. McDowell called concerns about Adobe Flash reducing battery life "absurd generalizations." Analyst Shaw Wu of Kaufman Bros. recently expressed concerns over development of the PlayBook, citing sources who claim that test units of the tablet only get "a few hours" of battery life. RIM quickly fired back, denying the claims and promising "superior performance with comparable battery life." Despite RIM's denials, Wu issued a follow-up report maintaining his stance that even matching the Samsung Galaxy Tab's battery life would require "significant engineering." Apple CEO Steve Jobs remains skeptical about 7-inch tablets, believing they "will be dead on arrival, and manufacturers will realize they're too small and abandon them next year. They'll then increase the size, abandoning the customers and developers who bought into the smaller format." The demonstration and UI looks really slick, certainly better than the Galaxy Tab using Android 2.2 and better than the mockup video of Android 3.0 ?designed for tablets?, so WTH is going on that it only has 4 hours left with 93% of battery remaining. How does 7% equate to more than 50% more run time? Corporations are going to buy tens of thousands of devices which only run on Wi-Max? Summer 2011? Wont the iPad 2 launch before that? Like in the video, maybe they had Quake 3, 1080p video playback, music player and a photo slide show going simultaneously and the time was affected by the rate of discharge? All running at full tilt in the background? While I?m sure there are many reading this tech forum that would love that option that isn?t what I?d call a consumer tablet. The demonstration and UI looks really slick, certainly better than the Galaxy Tab using Android 2.2 and better than the mockup video of Android 3.0 “designed for tablets”, so WTH is going on that it only has 4 hours left with 93% of battery remaining. How does 7% equate to more than 50% more run time? In crackberry.com video review, RIM executives stated on camera that they are shooting for 8 hours. They are probably demoing on the "all singing all dancing" multitasking mode right now. If RIM can do it, then it will be a good thing for Apple fans because it would create great pressure on Apple to put the flash player on the ipad2. Not going to argue there, RIM is confined to the business community and I think they know this, that's why all their talk is about corporations. In crackberry.com video review, RIM executives stated on camera that they are shooting for 8 hours. If they can do it, then it will be a good thing for Apple fans because it would create great pressure on Apple to put the flash player on the ipad2. Not following your logic. The iPad has about double the screen area, more pixels to push, and gets 25% more battery than what RiM executives are shooting for. Not to mention that interactive Flash sites on the web are still hit of miss on Android, Adobe would have to be the ones to make stable which they still can?t seem to do on Mac OS X, and, most importantly, Apple has nothing to fear from Flash. The ipad battery is also much larger. People are allowed to play with the Playbook at the CES booth, so we will know tomorrow whether flash is a hit or miss on the Playbook. So now it's delayed until Summer, and it's going to work only on Sprint? How well did the Palm Pre do on that tiny network. This has the makings of yet another has-been contestant. It's not going to be pretty. Yes it is and for good reason. A company will have to balance size, weight and battery usage to even begin to have a good product. So far, few companies achieve that consistently, and al the ones I can think of are doing it with well worn operating systems. Do you think Apple’s going to sit on 10 hours for the next iPad? I don’t. Do you think 8 hours is realistic for PlayBook for internet WiFi? I don’t. Maybe in a few years… if it lasts that long following in the Palm Pre’s tragic footsteps. Yes it is and for good reason. A company will have to balance size, weight and battery usage to even begin to have a good product. So far, few companies achieve that consistently, and al the ones I can think of are doing it with well worn operating systems. Do you think Apple?s going to sit on 10 hours for the next iPad? I don?t. Do you think 8 hours is realistic for PlayBook for internet WiFi? I don?t. Maybe in a few years? if it lasts that long following in the Palm Pre?s tragic footsteps. The next ipad will come with increased features that will eat up battery life. You can't increase battery life much because it is the slowest moving technology in the whole computer industry. It's a losing battle against feature creep. Why can't the Playbook be realistic to have 8 hours of battery life --- when the much more unpolished Android tablets have 6 hours. Beating android's battery performance is not that unrealistic goal. "In large companies, they're talking deployment in the tens of thousands, right off the bat," said Jeff McDowell, RIM's senior vice president of enterprise and platform marketing. Oh really? Corporate IT buys whatever product they think is most cost effective. But only if their CTO thinks the company and product will be around for years to come. Sounds like RIM is either giving them away free or bribing the CTOs to use PlayBook. And then promising to support PlayBook for a minimum number of years. Also for free. So other would-be corporate buyers (who didn't get the sweet, free deal) will be looking at the early PlayBook adopters. And looking closely at RIM's PlayBook sales numbers too. For a year or more. And they'll be looking closely at iPad too. Which is bad news for RIM. And just how many PlayBooks do you think you're going to sell in the mainstream consumer market, Jeff? Tens of thousands? Maybe tens of thousand a year. Weren?t you just saying last week that the PlayBook?s battery life be like so super great because it will use the more power efficient Cortex-A9 over that crappy Cortex-A8 in the current iPad? RIM still has the 2nd highest profit margin --- behind Apple. Even if Apple doesn't include flash in their ipad browser, the very fact that idiotic website designers will put out all kinds of CPU sucking HTML5 websites will decrease the battery life for the next gen ipad. That's why Apple designed their own custom batteries for all their portable devices. Because they wanted to get ahead of the industry. And I would argue that Windows is the slowest moving technology in the whole computer industry. In fact, Microsoft suppressed innovation in nearly the entire pee cee industry for about ten years by killing off smaller, faster, but more vulnerable competitors. But that's another story. PlayBook is still vaporware. There are a few demo units at CES, but RIM won't release actual shipping units until this summer. So nothing about PlayBook is realistic. Not battery life, not anything. kinds of CPU sucking HTML5 websites will decrease the battery life for the next gen ipad. That's BS and you know it. If my MacBook Pro is quiet like a dead man when i browse HTML5 site i think iPad will be fine. Which, if any, deactivated applications are re-activated: "When new applications become full screen" then "leave full screen". If yes, how does the system prioritize re-activation -- LIFO? Does this mean that if you want a long upload or download to continue in the background -- you must allow all applications to run in the background? Are any sort of Push Notifications allowed to activate or re-activate an application? What about location-tracking apps -- when cell radio versions become available. This tablet is targeted enterprise, Correct?